We continue to look to for service export opportunities internationally with a primary focus on emerging markets. Sub-Saharan Africa is a starting point. We are also be looking at export markets closer to home in the UK with anciliary links to Africa. 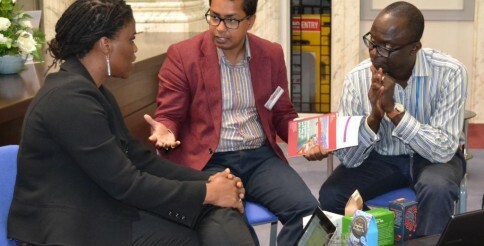 We have started to work with Value Added in Africa (VAA) based in Dublin in this respect. Ireland is an hour from the UK by air with close trading links with the UK . Irish exports of goods and services to Africa reached €2.7 billion in 2012 which represents an increase of some 200% in the three years since 2009. We view the potential gains of targeted knowledge exchange underpinned by strategic partnerships, such as work in progress with VAA, to increase work within Sub-Saharan Africa as promising. We have a working relationship with UKTI Team in London, Lagos, Nairobi, Dar-Es-Salaam, Addis-Ababa and Kampala . They are an invaluable resource in terms of their knowledge of local specialist skills network. As a result we are better positioned to tap into opportunities as well play a critical role within projects that require interdisciplinary responses. A current example is in Kenya’s Agri-business space where we are working with Value Added in Africa, Dublin, on a project supported by the UK Government and Marks and Spencer (M and S). “Marks and Spencer, a big Fairtrade supporter, visited Iriaini in 2010 during a trip in Kenya to better understand the impact Fairtrade is having. During the trip, the seeds of a plan were planted and with financial support from DFID, M and S leased a packing machine for the Iriaini Tea Factory. By packing at the source, farmers at Iriaini are strengthening their position and finding new channels with which to improve their living conditions. Iriaini is not only supplying the UK and Irish market, it is selling product locally across the Kenyan market – source Fair Trade online. For Kenyan producers and manufacturers, establishing high levels of assurance for quality production continues to be an important factor in the development of direct supply relationships with international and regional retailers. This applies to export markets such in the UK, Ireland, the local market and beyond: considering M and S’s international reach. Marks and Spencer C-level team were in Iriani at the end of 2013 to strengthen links with Iriani – a good sign for business. With VAA we have begun the process of researching UK user-groups and developing an artisanal brand for Iriaini in the UK and Irish market. With some informal qualitative research and co-creative workshops among a small representative of Dublin based Tea shoppers and consumers as well as participants at design innovation workshop at Strathmore University Nairobi, we are discovering on behalf of and with Iriaini that consumer experience design challenges are down to the character of the UK, Irish and Kenyan consumer. One of the culture for export challenges cited by UKTI colleagues in Kenya and probably experienced by Independent Kenyan manufacturers is the top down attitude to brand creation where emphasis placed on brand philosophy, provenance, product identity and structural design as integral to brand experience has historically not being placed in context of the consumer experience. That a key consumer segment in UK and Ireland appreciate provenance, are ethical consumers who experience of products that have been validated by independent evidence demonstrating product functioning is a growing area of interest among local smes. Colleagues at UKTI in kenya are linking us (VAA, Strathmore University and OsanNimu) to a value chain of local interested parties, from academia through to producers and specialist product development organisations. The development of direct supply relationships, such as the kind which Iriaini has with Marks and Spencer, enables producers to better understand the retailers’ requirements and opens up scope for local value creation. As products are prepared and packed in line with shelf-ready requirements of the individual retailers, new product development capability is next in line. Participatory and co-creative design development projects to better understand “branded consumer experience” becomes imperative in this context. With this in mind our strategic project partnerships are being designed to support total value chain development capacity to support export strategies. Multi-sector client feedback from some of the workshops we are running both in Kenya and Uganda are beginning to give OsanNimu and project partners credibility within the East Africa market space. Photograph © UKTI Southeast. Photographer Carley Willis.